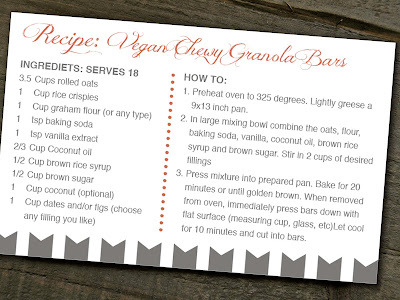 Healthy Chewy Granola Bars! And Na-Tee-Na Recipe Cards Too! I have been busy working on adding items to my Etsy site and one of the newest additions I will be posting later today are some editable recipe cards. First off, I was looking for a chewy and healthy granola bar to give to my girls instead of buying them with all the additives they put in them these days. And the chewy part was important because my littlest just has a mere 7.5 teeth and no molars. I found a recipe that I thought would be a good starting point and after several trials and tribulations, I came up with this one you see on my Etsy Editable Recipe Card that I am sharing with you today. I substituted the butter for coconut oil, most of the sugar for brown rice syrup, chocolate chips for dates and figs, and then used graham flower instead of white flour. All in all, I have to say they are pretty good and my girls like them too. Kid tested, mother approved as they say. The cards come two to a page and you can type in your recipe in the PDF and then simply print on card stock and trim. 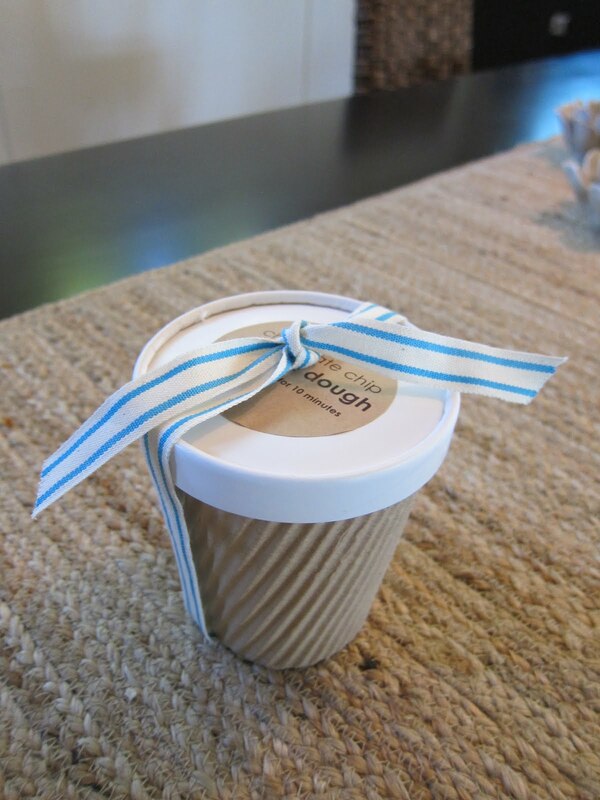 A great way to hand down your favorite recipes or for gifts...and everyone will be able to read your writing! We've had a few home projects going on around our house lately. One of them that is checked off the list is the addition to our kitchen nook. I am thrilled with the end result too! I have been pondering our existing blank abd boring space for years and was amiss at what I really wanted for that space. I searched high and low for the right buffet or long cabinet, but nothing fit the bill size-wise or style-wise. Finally I stumbled across a photo from Elle Decor from their Miami showcase addition and it hit me - an aha moment! With a few adjustments to the design I knew it would look great in our space as well as blend with the style of our home. I am ultra fortunate to have an amazingly handy husband and father-in-law so some of the monumental projects are a possibility for us. Over a few weeks my husband worked in the evenings getting the chalkboard wall just perfect, sprayed the cabinets with a prefect finish of paint and aligned the porcelain sconces just so. Oh, and one of the coolest features...there is a TV hiding below and comes up with a touch of a button! I'll love this when we are entertaining and there is a game on that all the guys want to huddle around to watch. Now that I have lived with the cabinets and wall for about a month now, I have a hard time picturing how BORING the nook was before! I have yet to write on the wall, but will as soon as I am inspired. Maybe our next party I'll put the menu for the evening on the wall. Such drastic changes creates a snowball effect of other purchases, right? Now I am shopping for a rustic round table (kid proof), modern white chairs (easily wipe clean!!! ), and a Flor rug under the table. Next project: finish our office cabinetry!! Etsy Launch & Free Printable Mother's Day Card - Oh My! The last several weeks have been quite busy. Not only did I have my friend's shower I was putting together, but I decided to start a little shop on Etsy called Na-Tee-Na. Timing-wise, I don't know what got in to me, but I was inspired and sometimes when inspiration hits, you just have to go for it regardless of good or bad timing. I was creating some applique onesies for my friend's shower gift and it struck me that I could sell the templates so others can print them out and make their own variations of my designs with different fabrics. 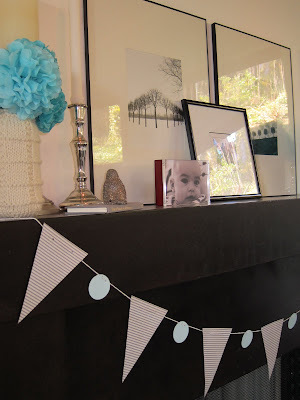 Once that idea got going, I realized that over the last several years of hosting parties and birthdays, I have started to gather quite the collection of invitations and printables that are sadly sitting in no mans land files. I created them out of love for the ones who were being honored and thought it was a shame for them to never be used again. So why not add them to my little shop as well and people can purchase the templates to print themselves?! So Na-Tee-Na was born and I have been feverishly trying to add and create in my limited spare time. The name Na-Tee-Na came from the game I have been playing with my little girls when I change their cute bums on the changing pad. In greek, Na Tee Na means "there she is" (or loosely based on). It has been our peek-a-boo game and will always hold fond memories for me as the girls grow older. To celebrate the launch, I am giving a free printable download for a Mother's Day card to share with your moms. Please check out my Etsy site and I hope you enjoy the designs as much as I do! I will be adding more items as the weeks and months continue too! The invitation was a lot of fun to make. Especially since it was for a boy and I have two girls. A departure from the frilly and pink was refreshing! 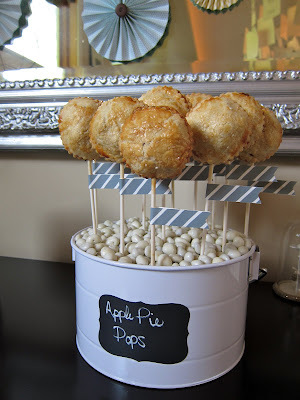 Instead of the increasingly getting played out cake pops, I tried my hand at pie pops and they were fun to eat. Like a grown up lollipop...or pie for kids. Whichever way you want to look at it. I found these Salted Caramel Brownies from another blogger Pink Parsley and OMG - died and gone to heaven! You must try them!!! I have been on an organizing kick lately. It's been sparked by the numerous things my kids acquire and/or need as they get older. Whether it be toys, saving clothes for my younger daughter, or my craft supplies accumulating the more birthday parties we have. Recently I bought a Martha Stewart organizing magazine (I rarely buy these types of magazines, but I was in the mood), which had some great little tips in it. Of course it was pumped all of the numerous Martha products, but I didn't mind, because as much I don't want to, I usually love her products over others that are similar. Lately, I have been struggling with what to do with some of my older daughter's pictures she has drawn or painted (My one year old has yet to successful not try to eat the crayon). I am not one to keep every single little thing, but I do want to look back and remember those times when girls drew me a picture or started drawing actual figures, versus scribble. I saw this idea in the Martha magazine and think it's a great solution that can grow as the girls get older. I went to The Container Store and bought simple white shipping tubes as well as the wire basket. 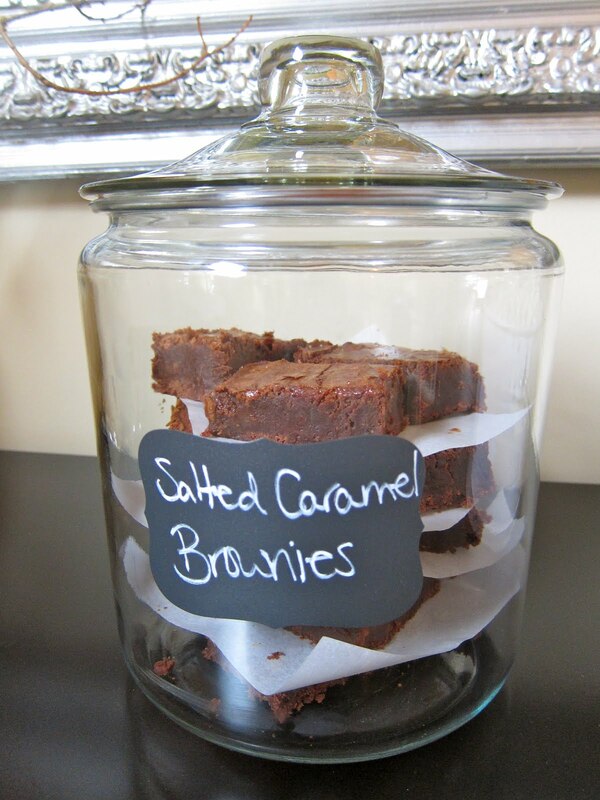 Then I bought the Martha Stewart Chalkboard labels from Staples. They feel more like vinyl, but they really do erase easily...I should know. I erased them numerous times with my poor penmanship! 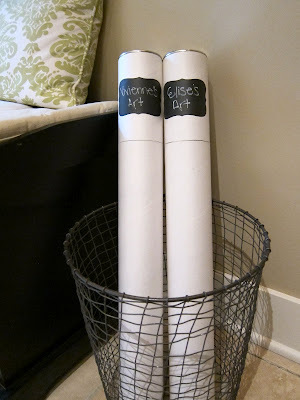 What I love most about this little project - simple!!! Check out all of Martha's other labels available at Staples too. I bought some of the kraft and white paper ones as well that I am looking forward to using. And aside from the chalkboard labels, most of them you should be able to run through your printer. Bonus! It's been, yet again, a long while since I have been blogging. 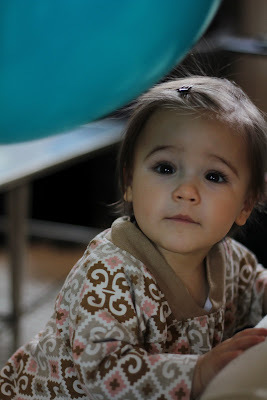 There is something about having little babies, that brings blogging to the sidelines for me. But now my second baby girl just turned one and a little bit of my sanity is returning. There is something to be said for a full nights sleep! 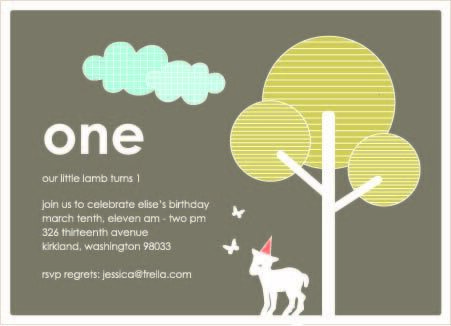 I went with a spring theme with a lamb for the invitation and then took everything else from there. The week prior, a few of us planned a fundraiser for our dear friend battling cancer and I was in charge of the decorations. It was a large undertaking, but something I would do again in a heartbeat. God willing, I never have too. That said, I learned to knit myself a few months ago, and summoned all the knitters I could to help knit all these wonderful sweater vases (idea from Design Sponge) in neutral shades and various patterns. 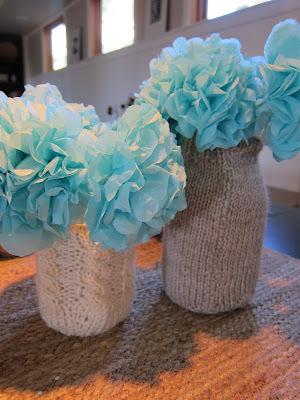 I also had a work party to help make all of tissue flowers to fill the vases. They are super cheap and easy! In smaller quantities of course and not 100+! All of the generous friends and family who contributed were monumental! Given that was the week before Elise's party, I made a few of the leftover vases and flowers do double duty since I was short on time (and energy). Thankfully the color scheme worked for both parties! To round out the rest of the decorations, I did the staple balloon bouquets, made a coordinating garland and party hat. I pretty much started to really think about the party about five days before hand. Uggh! Thanks to Garnishes fast deliver and reliable and tasteful party garnishes, it was manageable to pull off. I made Barefoot Contessa's chocolate chop cookie dough (always a pleaser) froze the dough in balls and then put them in these Garnish containers with a printed label and ribbon for favors. Then the rest of the menu was a simple salmon salad with ciabatta rolls, sesame snap peas, fruit salad in Garnish soup cups and labels, and last, but certainly not least, Top Pot Donuts. It was all delicious, but there was a snafu with the salad...peppercorns were accidentally used instead of capers. Not all was lost, there was just an extra "bite" to the salad. This year, I was relieved of the cake duty - yahoo! I have to admit, I am willing to tackle most things myself, but cake decorating is very daunting to me. One of my husband's, good friends has been starting to make wonderful pastries and beautifully decorated cakes. He was gracious enough to make a delicious carrot cake that was SO perfect! He took the invite and made it in to a cake! It's always wonderful to have your closest friends and family there to celebrate your child's birthday. And no matter how much detail you put into a party, it's the warmth of having everyone gathered that makes the day special. I think that is why I always want to put so much effort in to each event. I want the surroundings to match the appreciation I feel to each and every person attending and sharing their love. With that, I look forward to posting and sharing some more ideas! 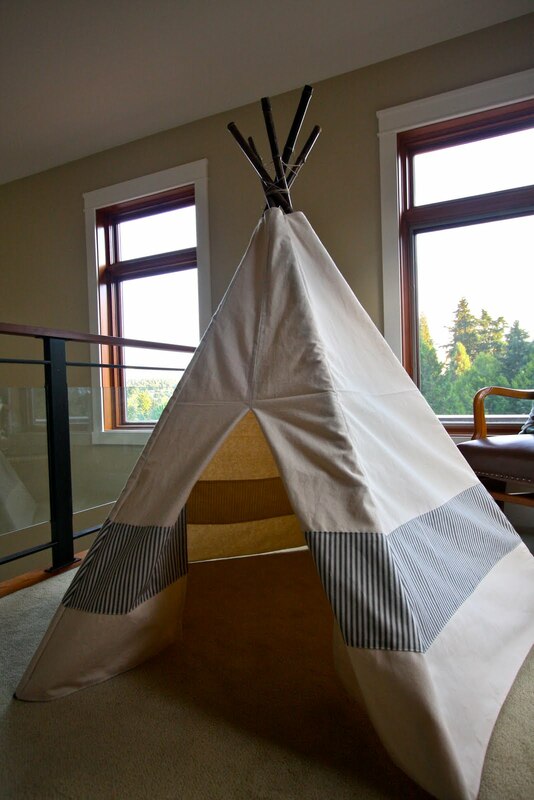 Children's Tee Pee: Can I Have One? Well hello there! It seems that when I am pregnant I have a hard time keeping up with my blog. We have number two on the way and I am pretty excited, nervous and clueless as to what to expect. I think I am getting in to my nesting mode again, but since we don't know if we are having a boy or girl yet, Viv is still reaping the rewards. I got inspired by a little birdie to make a tee pee for Vivienne and No. 2. After seeing a few online, I what was blown away by the prices. I was not so blown away however, by the designs. I thought it would be fun to design one that was a little rustic and authentic, but with a modern sensibility. So here is my take on a children's tee pee. I used natural cotton canvas, jute twine, bamboo poles and cotton rope for the ties.I was going to wait until Christmas to give it to Viv, but I was the little kid in the scenario and couldn't wait to get in it myself. So we now have a tee pee in our house and I quite love it. Remember making forts as a child and wanting to have your own private space? Well I think I still want that as an adult and climb in with Viv to read stories. She let's me in for now, but give her 6 months or so and I may be banned from her private abode. I am thinking of putting them on Etsy, so if you are interested in your own custom tee pee, let me know! What a week it was! Not only did I have a shower to host for my good friend, but I came down with a cold/flu (not sure which it was) during the week. Having a cold didn't help me pick away at my to-do list by any means. After dragging my feet around all week, I did manage to get most of my tasks accomplished. And the shower turned out to be a wonderful success. I was mostly worried about making it as special as I could for Andrea. She is a dear friend and I wanted her to know how much she deserved a special day in her honor. I didn't get as many photos taken as I would have liked, but I did take a few. I tried my best at tying all the elements of the party together, from the invitations (see post here) all the way to the end with the parting gifts. I used the flowers from the invitations where I could and thought it made a nice touch on the notepad gift tags reading "Mahalo". She is getting married in Hawaii so I introduced a slight Hawaiin theme without going overboard. 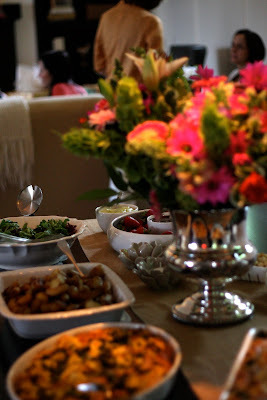 To keep with the Hint-O Hawaiin idea, for the food we served (this was brunch) strata, garlic roasted potatoes, baby green salad, strawberries with lime curd or oh-so-yummy and easy chocolate sauce, vegan coconut cupcakes and vegan mini chocolate donuts from Seattle's Mighty-O. To clear up the vegan bit, my friend is allergic to dairy and soy so I had to at least try to serve most of the food for her to eat. To side step the strata part, my mom graciously made her an omlette sans cheese. And for drinks, we served mimosas tropic style with champagne and tropical juice accompanied with the drink umbrellas I made a while back (see picture here) which were a big hit! The flowers Andrea's mom brought were just gorgeous and made the table sing! She put them in silver vases that were her grandmother's which made it all the more sentimental. And if that doesn't pull your heart strings, her long time friend Devon put together the sweetest slideshow of the cute couple that had us all teared up at the end! All in all I think it was a success and I just hope that Andrea enjoyed herself and knows how much I and all the wonderful ladies who came love her to bits. PS - I made her an embroidered pillow which I will share in a few days or early next week. It was way more work I had intended, but in the end I am pleased how it came out.